United States Steel Corporation (NYSE: X), more commonly known as U. S. Steel, is an American integrated steel producer headquartered in Pittsburgh, Pennsylvania, with production operations in the United States and Central Europe. As of 2016, the company was the world's 24th-largest steel producer and second-largest domestic producer, trailing only Nucor Corporation. Though renamed USX Corporation in 1986, the company returned to its present name in 2001 after spinning off its energy business, including Marathon Oil, and other assets from its core steel concern. The company experienced significant downsizing during the 1980s; a decline in market capitalization resulted in its removal from the S&P 500 Index in 2014. J. P. Morgan and attorney Elbert H. Gary founded U.S. Steel on March 2, 1901 (incorporated on February 25) by combining Andrew Carnegie's Carnegie Steel Company with Gary's Federal Steel Company and William Henry "Judge" Moore's National Steel Company for $492 million ($14.82 billion today). At one time, U.S. Steel was the largest steel producer and largest corporation in the world. It was capitalized at $1.4 billion ($42.2 billion today), making it the world's first billion-dollar corporation. The company established its headquarters in the Empire Building at 71 Broadway in New York City; it remained a major tenant in the building for 75 years. In 1907 US Steel bought its largest competitor, the Tennessee Coal, Iron and Railroad Company, which was headquartered in Birmingham, Alabama. Tennessee Coal was replaced in the Dow Jones Industrial Average by the General Electric Company. The federal government attempted to use federal antitrust laws to break up U.S. Steel in 1911, but that effort ultimately failed. In 1902, its first full year of operation, U.S. Steel made 67 percent of all the steel produced in the United States. About 100 years later, as of 2001 it produced only 8 percent more than it did in 1902 and its shipments accounted for only about 8 percent of domestic consumption. The Corporation, as it was known on Wall Street, was distinguished by its size, rather than for its efficiency or creativeness during its heyday. In 1901, it controlled two-thirds of steel production and, through its Pittsburgh Steamship Company, developed the largest commercial fleet on the Great Lakes. Because of heavy debts taken on at the company's formation—Carnegie insisted on being paid in gold bonds for his stake—and fears of antitrust litigation, U.S. Steel moved cautiously. Competitors often innovated faster, especially Bethlehem Steel, run by U.S. Steel's former first president, Charles M. Schwab. U.S. Steel's share of the expanding market slipped to 50 percent by 1911. James A. Farrell was named president in 1911 and served until 1932. U.S. Steel ranked 16th among United States corporations in the value of World War II production contracts. Production peaked at more than 35 million tons in 1953. Its employment was greatest in 1943, when it had more than 340,000 employees. The federal government intervened to try to control U.S. Steel. President Harry S. Truman attempted to take over its steel mills in 1952 to resolve a crisis with its union, the United Steelworkers of America. The Supreme Court blocked the takeover by ruling that the president did not have the Constitutional authority to seize the mills (see Youngstown Sheet & Tube Co. v. Sawyer.) President John F. Kennedy was more successful in 1962 when he pressured the steel industry into reversing price increases that Kennedy considered dangerously inflationary. In the postwar years, the steel industry and heavy manufacturing went through restructuring that caused a decline in US Steel's need for labor, production, and portfolio. Many jobs moved offshore. By 2000, the company employed 52,500 people. The U.S. Steel Tower in downtown Pittsburgh. In the early days of the Reagan Administration, steel firms won substantial tax breaks in order to compete with imported goods. But instead of modernizing their mills, steel companies shifted capital out of steel and into more profitable areas. In March 1982, U.S. Steel took its concessions and paid $1.4 billion in cash and $4.7 billion in loans for Marathon Oil, saving approximately $500 million in taxes through the merger. The architect of tax concessions to steel firms, Senator Arlen Specter (R-PA), complained that "we go out on a limb in Congress and we feel they should be putting it in steel." The events are the subject of a song by folk singer Anne Feeney. In 1984 the federal government prevented U.S. Steel from acquiring National Steel, and political pressure from the United States Congress, as well as the United Steelworkers (USW), forced the company to abandon plans to import British Steel Corporation slabs. U.S. Steel finally acquired National Steel's assets in 2003 after National Steel went bankrupt. As part of its diversification plan, U.S. Steel had acquired Marathon Oil on January 7, 1982, as well as Texas Oil and Gas several years later. Recognizing its new scope, it reorganized its holdings as USX Corporation in 1986, with U.S. Steel (renamed USS, Inc.) as a major subsidiary. About 22,000 USX employees stopped work on August 1, 1986, after the United Steelworkers of America and the company could not agree on new employee contract terms. This was characterized by the company as a strike and by the union as a lockout. This resulted in most USX facilities becoming idle until February 1, 1987, seriously degrading the steel division's market share. A compromise was brokered and accepted by the union membership on January 31, 1987. On February 4, 1987, three days after the agreement had been reached to end the work stoppage, USX announced that four USX plants would remain closed permanently, eliminating about 3,500 union jobs. The closure of many plants created the term "rust belt" for a region of idle and derelict factories. Corporate raider Carl Icahn launched a hostile takeover of the steel giant in late 1986 in the midst of the work stoppage. He conducted separate negotiations with the union and with management and proceeded to have proxy battles with shareholders and management. But he abandoned all efforts to buy out the company on January 8, 1987, a few weeks before union employees returned to work. The U. S. Steel Tower in New York City (now One Liberty Plaza). At the end of the twentieth century, the corporation was deriving much of its revenue and net income from its energy operations. Led by CEO Thomas Usher, U.S. Steel spun off Marathon and other non-steel assets (except railroad company Transtar) in October 2001. It expanded internationally for the first time by purchasing operations in Slovakia and Serbia. In the early 2010s, U. S. Steel began investing to upgrade software programs throughout their manufacturing facilities. In January 2012, U.S. Steel sold its Serbian mills outside Belgrade to the Serbian government, as their operations had been running at an economic loss. On May 2, 2014, U. S. Steel announced an undisclosed number of layoffs affecting employees worldwide. On July 2, 2014, U.S. Steel was removed from S&P 500 index and placed in the S&P MidCap 400 Index, in light of its declining market capitalization. U.S. Steel once owned the Northampton & Bath Railroad. The N&B was an 11-kilometer (6.8 mi) short-line railroad built in 1904 that served Atlas Cement in Northampton, Pennsylvania, and Keystone Cement in Bath, Pennsylvania. By 1979 cement shipments had dropped off such that the railroad was no longer economically viable, and US Steel abandoned the line. A 1.5-kilometer (0.93 mi) section of track was retained to serve Atlas Cement. The remainder of the right-of-way was transformed into the Nor-Bath Trail. U.S. Steel also owned the Atlantic City Mine Railroad, whose 76.7-mile line in Wyoming operated from 1962 until 1983 and served an iron ore mine north of Atlantic City, Wyoming. Through its Transtar subsidiary, U.S. Steel also owned other railroads that served its mines and mills. Those properties included the Duluth, Missabe & Iron Range Railway in the iron-mining region of northeast Minnesota; the Elgin, Joliet & Eastern that served its Gary Works in northwest Indiana; the Birmingham Southern serving the U.S. Steel mill in Birmingham, Alabama; and the Bessemer & Lake Erie and Union railroads in western Pennsylvania that delivered iron ore and provided plant-switching services at its mill complex in Braddock, Pennsylvania and coke works in Clairton, Pennsylvania. U. S. Steel also owned a large Great Lakes commercial freighter fleet, under the Pittsburgh Steamship Company, that transported its raw materials from the Duluth area to Ashtabula, Gary, and Conneaut, Ohio. The laker fleet, the B&LE, and the DM&IR were acquired by Canadian National after U.S. Steel sold most of Transtar to that company. The ships are leased out to a different, domestic operator because of United States cabotage law. U.S. Steel is a former Dow Jones Industrial Average component, listed from April 1, 1901, to May 3, 1991. It was removed under its USX Corporation name with Navistar International and Primerica. An original member of the S&P 500 since 1957, U.S. Steel was removed from that index on July 2, 2014, due to declining market capitalization. The Board of Directors considers the declaration of dividends four times each year, with checks for dividends declared on common stock mailed for receipt on 10 March, June, September, and December. In 2008, the dividend was $0.30 per share, the highest in company history, but on April 27, 2009, it was reduced to $0.05 per share. Dividends may be paid by mailed check, direct electronic deposit into a bank account, or be reinvested in additional shares of U.S. Steel common stock. U. S. Steel maintained the labor policies of Andrew Carnegie, which called for low wages and opposition to unionization. The Amalgamated Association of Iron and Steel Workers union that represented workers at the Homestead, Pennsylvania, plant was, for many years, broken after a violent strike in 1892. U.S. Steel defeated another strike in 1901, the year it was founded. U.S. Steel built the city of Gary, Indiana in 1906, and 100 years later it remained the location of the largest integrated steel mill in the Northern Hemisphere. U.S. Steel reached a détente with unions during World War I, when under pressure from the Wilson Administration it relaxed its opposition to unions enough to allow some to operate in certain factories. It returned to its previous policies as soon as the war ended, however, and in a 1919 strike defeated union-organizing efforts by William Z. Foster of the AFL. Heavy pressure from public opinion forced the Company to give up its 12-hour day and adopt the standard eight-hour day. During the 1920s, U.S. Steel, like many other large employers, coupled paternalistic employment practices with "employee representation plans" (ERPs), which were company unions sponsored by management. These ERPs eventually became an important factor leading to the organization of the United Steelworkers of America. The Company dropped its hard-line, anti-union stance in 1937, when Myron Taylor, then president of U.S. Steel, agreed to recognize the Steel Workers Organizing Committee, an arm of the Congress of Industrial Organizations (CIO) led by John L. Lewis. Taylor was an outsider, brought in during the Great Depression to rescue U.S. Steel, and had no emotional investment in the Company's long history of opposition to unions. Watching the upheaval caused by the United Auto Workers' successful sit-down strike in Flint, Michigan, and convinced that Lewis was someone he could deal with on a businesslike basis, Taylor sought stability through collective bargaining. The Steelworkers continue to have a contentious relationship with U.S. Steel, but far less so than the relationship that other unions had with employers in other industries[which?] in the United States. They launched a number of long strikes against U.S. Steel in 1946 and a 116-day strike in 1959, but those strikes were over wages and benefits and not the more fundamental issue of union recognition that led to violent strikes elsewhere. The Steelworkers union attempted to mollify the problems of competitive foreign imports by entering into a so-called Experimental Negotiation Agreement (ENA) in 1974. This was to provide for arbitration in the event that the parties were not able to reach agreement on any new collective bargaining agreements, thereby preventing disruptive strikes. The ENA failed to stop the decline of the steel industry in the U.S.
U.S. Steel and the other employers terminated the ENA in 1984. In 1986, U.S. Steel employees stopped work after a dispute over contract terms, characterized by the company as a strike and by the union as a lockout. In a letter to striking employees in 1986, Johnston warned, "There are not enough seats in the steel lifeboat for everybody." In addition to reducing the role of unions, the steel industry had sought to induce the federal government to take action to counteract dumping of steel by foreign producers at below-market prices. Neither the concessions nor anti-dumping laws have restored the industry to the health and prestige it once had. During the 1948 Donora smog, an air inversion trapped industrial effluent (air pollution) from the American Steel and Wire plant and U.S. Steel's Donora Zinc Works in Donora, Pennsylvania. In three days, 20 people died... After the inversion lifted, another 50 died, including Lukasz Musial, the father of baseball great Stan Musial. Hundreds more lived the rest of their lives with damaged lungs and hearts. But another 40 years would pass before the whole truth about Donora's bad air made public-health history. Today the Donora Smog Museum in that city tells of the influence that the hazardous Donora Smog had on the air quality standards enacted by the federal government in subsequent years. Researchers at the Political Economy Research Institute have ranked U.S. Steel as the eighth-greatest corporate producer of air pollution in the United States (down from their 2000 ranking as the second-greatest). In 2008, the company released more than one million kg (2.2 million pounds) of toxins, chiefly ammonia, hydrochloric acid, ethylene, zinc compounds, methanol, and benzene, but including manganese, cyanide, and chromium compounds. In 2004, the city of River Rouge, Michigan and the residents of River Rouge and the nearby city of Ecorse filed a class-action lawsuit against the company for "the release and discharge of air particulate matter...and other toxic and hazardous substances" at its River Rouge plant. The Company has also been implicated in generating water pollution and toxic waste. In 1993, the Environmental Protection Agency (EPA) issued an order for U.S. Steel to clean up a site on the Delaware River in Fairless Hills, Pennsylvania, where the soil had been contaminated with arsenic, lead, and other heavy metals, as well as naphthalene. Groundwater at the site was found to be polluted with polycyclic aromatic hydrocarbons and trichloroethylene (TCE). In 2005, the EPA, United States Department of Justice, and the State of Ohio reached a settlement requiring U.S. Steel to pay more than $100,000 in penalties and $294,000 in reparations in answer to allegations that the company illegally released pollutants into Ohio waters. U.S. Steel's Gary, Indiana facility has been repeatedly charged with discharging polluted wastewater into Lake Michigan and the Grand Calumet River. In 1998 the company agreed to payment of a $30 million settlement to clean up contaminated sediments from a five-mile (8 km) stretch of the river. With the exception of the Fairless Hills and Gary facilities, the lawsuits concern facilities acquired by US Steel via its 2003 purchase of National Steel Corporation, not its historic facilities. 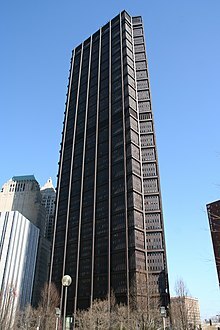 The U.S. Steel Tower in Pittsburgh, Pennsylvania is named after the company and since 1970, the company's corporate headquarters have been located there. It is the tallest skyscraper in the downtown Pittsburgh skyline built out of the companies CorTen Steel. New York City's One Liberty Plaza was also built by the corporation as that city's U.S. Steel Tower in 1973. When the Steelmark logo was created, U.S. Steel attached the following meaning to it: "Steel lightens your work, brightens your leisure and widens your world." The logo was used as part of a major marketing campaign to educate consumers about how important steel is in people's daily lives. The Steelmark logo was used in print, radio and television ads as well as on labels for all steel products, from steel tanks to tricycles to filing cabinets. In the 1960s, U.S. Steel turned over the Steelmark program to the AISI, where it came to represent the steel industry as a whole. During the 1970s, the logo's meaning was extended to include the three materials used to produce steel: yellow for coal, orange for ore and blue for steel scrap. In the late 1980s, when the AISI founded the Steel Recycling Institute (SRI), the logo took on a new life reminiscent of its 1950s meaning. The Pittsburgh Steelers professional football team borrowed elements of its logo, a circle containing three hypocycloids, from the Steelmark logo belonging to the American Iron and Steel Institute (AISI) and created by U.S. Steel. In the 1950s, when helmet logos became popular, the Steelers added players' numbers to either side of their gold helmets. Later that decade, the numbers were removed and in 1962, Cleveland's Republic Steel suggested to the Steelers that they use the Steelmark as a helmet logo. U.S. Steel financed and constructed the Unisphere in Flushing Meadows-Corona Park, Queens, New York for the 1964 World's Fair. It is the largest globe ever made and is one of the world's largest free-standing sculptures. The Chicago Picasso sculpture was fabricated by U.S. Steel in Gary, Indiana, before being disassembled and relocated to Chicago. U.S. Steel donated the steel for the cathedral of St. Michael's in Chicago since 90 percent of the parishioners worked at its mills. U.S. Steel sponsored The United States Steel Hour television program from 1945 until 1963 on CBS. U.S. Steel built both the Disney's Contemporary Resort and the Disney's Polynesian Resort in 1971 at Walt Disney World, in part to showcase its residential steel building "modular" products to high-end and luxury consumers. U.S. Steel was also involved with Florida real estate development including building beachfront condominiums during the 1970s, such as Sand Key near Daytona Beach, Florida, and the Pasadena Yacht and Country Club near St. Petersburg, Florida. U.S. Steel has multiple domestic and international facilities. Of note in the United States is Clairton Works, Edgar Thomson Works, and Irvin Plant, which are all members of Mon Valley Works  just outside Pittsburgh, Pennsylvania. 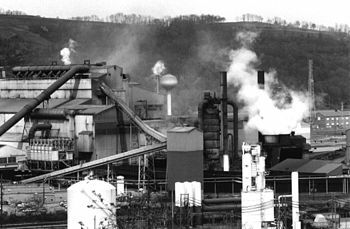 Clairton Works is the largest coking facility in North America. Edgar Thomson Works is one of the oldest steel mills in the world. The Company acquired Great Lakes Works and Granite City Works, both large integrated steel mills, in 2003 and is partnered with Severstal North America in operating the world's largest electro-galvanizing line, Double Eagle Steel Coating Company at the historic Rouge complex in Dearborn, Michigan. U.S. Steel's largest domestic facility is Gary Works, in Gary, Indiana, on the shore of Lake Michigan. For many years, the Gary Works Plant was the largest steel mill and it remains the largest integrated mill in North America. It was built in 1906 and has been operating since 28 June 1908. Gary is also home to the U.S. Steel Yard baseball stadium. U.S. Steel operates a tin mill in East Chicago now known as East Chicago Tin. The mill was idled in 2015, but reopened shortly after. U.S. Steel operates a sheet and tin finishing facility in Portage, Indiana, known as Midwest Plant, acquired after the National Steel Corporation bankruptcy. U.S. Steel acquired National Steel Corporation in May 2003 for $850 million and assumption of $200 million in debt. U.S. Steel operates Great Lakes Works in Ecorse, Michigan, Midwest Plant in Portage, Indiana, and Granite City Steel in Granite City, Illinois. In 2008 a major expansion of Granite City was announced, including a new coke plant with an annual capacity of 650,000 tons. U.S. Steel operates Fairfield Works in Fairfield, Alabama (Birmingham), employing 1,500 people, and operates a sheet galvanizing operation at the Fairless Works facility in Fairless Hills, Pennsylvania, employing 75 people. U.S. Steel operates five pipe mills: Fairfield Tubular Operations in Fairfield, Alabama (Birmingham), Lorain Tubular Operations in Lorain, Ohio, McKeesport Tubular Operations, in McKeesport, PA, Texas Operations (Formerly Lone Star Steel) in Lone Star, TX, and Bellville Operations in Bellville, TX. U.S. Steel operates two major taconite mining and pelletizing operations in northeastern Minnesota's Iron Range under the operating name Minnesota Ore Operations. The Minntac mine is located near Mountain Iron, Minnesota and the Keetac mine is near Keewatin, Minnesota. U.S. Steel announced on February 1, 2008, that it would be investing approximately $300 Million in upgrading the operations at Keetac, a facility purchased in 2003 from the now-defunct National Steel Corporation. Internationally, U.S. Steel operates facilities in Slovakia (former East Slovakian Iron Works in Košice). It also operated facilities in Serbia – former Sartid with facilities in Smederevo (steel plant, hot and cold mill) and Šabac (tin mill). U.S. Steel added facilities in Texas with the purchase of Lone Star Steel Company in 2007. The company operates 2 joint ventures in Pittsburg, California with POSCO of South Korea. U.S. Steel added facilities in Hamilton and Nanticoke, Ontario, Canada with the purchase of Stelco (now U.S. Steel Canada) in 2007. These facilities were sold in 2016 to venture capital firm Bedrock Resources and has since been renamed Stelco. The blast furnaces in Hamilton have not been reactivated as they were shut down by US Steel in 2013, but those at Nanticoke are functional. The company opened a training facility, the Mon Valley Works Training Hub, in Duquesne, Pennsylvania in 2008. The state-of-the-art facility, located on a portion of the property once occupied by the company's Duquesne Works, serves as the primary training site for employees at U.S. Steel's three Pittsburgh-area Mon Valley Works locations. This site also served as the company's temporary technical support headquarters during the 2009 G20 Summit. Elbert Henry Gary 1903 – August 15, 1927 (or 1911 per James Augustus Farrell obituary). William A. Irvin April 19, 1932 – January 1, 1938. Benjamin Franklin Fairless January 1, 1938 – May 3, 1955. Irving Sands Olds 1940 - 1952. Roger Blough May 3, 1955 – January 31, 1969. Edwin H. Gott January 31, 1969 – March 1, 1973. Edgar B. Speer March 1, 1973 – April 24, 1979. David M. Roderick April 24, 1979 – May 31, 1989. Charles A. Corry May 31, 1989 – July 1, 1995. Thomas Usher July 1, 1995 – October 1, 2004. John Surma October 1, 2004 – September 1, 2013. Mario Longhi September 1, 2013 – May 10, 2017. David Burritt May 10, 2017 – Present. In the 1974 classic The Godfather Part II, Hyman Roth, played by Lee Strasberg says to Michael Corleone: "Michael...we're bigger than U.S. Steel." U.S. Steel's revenues in 1958, the year in which that scene is set, were $4.4 billion, or $38.3 billion in 2019 dollars. ^ a b c d e Corporation, United States Steel (2018-01-31). "United States Steel Corporation Reports Fourth Quarter and Full-Year 2017 Results". globenewswire.com. Retrieved 27 July 2018. ^ "US Steel on the Forbes Global 2000 List". forbes.com. Retrieved 27 July 2018. ^ a b c d e f g h i Boselovic, Len (February 25, 2001). "Steel Standing: U.S. Steel celebrates 100 years". PG News – Business & Technology. post-gazette.com – PG Publishing. Retrieved 6 August 2013. ^ a b c "Martin Marietta Materials Set to Join the S&P 500" (PDF). www.spice-indices.com. 2014-06-27. Retrieved 2014-06-27. ^ "Hitchcock's Holdup by Sam Tamburro". The Cleveland Memory Project. Retrieved 17 April 2017. ^ Morris, Charles R. The Tycoons: How Andrew Carnegie, John D. Rockefeller, Jay Gould, and J.P. Morgan invented the American supereconomy, H. Holt and Co., New York, 2005, pp.255–258. ISBN 0-8050-7599-2. ^ "United States Steel Corporation History". FundingUniverse. Retrieved 3 January 2014. ^ "US Steel". case.edu. Archived from the original on 2013-11-12. Retrieved 17 April 2017. ^ "Empire Building Landmark Report" (PDF). New York City Landmarks Preservation Commission 25 June 1996. Archived from the original (PDF) on 12 November 2013. Retrieved 2 September 2013. ^ a b Douglas Blackmon (2008). Slavery by Another Name: The Re-enslavement of Black Americans from the Civil War to World War Two. Anchor Books. ISBN 978-0-385-50625-0. ^ "The Untold History of Post-Civil War 'Neoslavery'". ^ Alan F. Westin, The Anatomy of a Constitutional Law Case: Youngstown Sheet and Tube Co. V. Sawyer, the Steel Seizure Decision (1990). ^ John Hinshaw (February 2012). Steel and Steelworkers: Race and Class Struggle in Twentieth-Century Pittsburgh. SUNY Press. p. 238. ISBN 9780791489406. ^ John Leopard. Duluth, Missabe & Iron Range Railway. Voyageur Press. p. 105. ISBN 9781610606257. ^ a b c Nash, Bradley, Jr. (2000). "Chapter Six: Strikes and the Reagan Labor Law Project—Three Case Studies". Labor Law and the State: The Crises of Unions in the 1980s (Ph.D.). Archived from the original on 2013-05-26. Retrieved 2014-01-07. ^ Business Week (2007). Strategy Power Plays: How the World's Most Strategic Minds Reach the Top of Their Game. New York, NY: McGraw-Hill. pp. 111–120. ISBN 978-0-07-147560-0. Retrieved 2009-12-18. ^ Boselovic, Len (2013-05-17). "Can pricey software streamline U.S. Steel?". Pittsburgh Post-Gazette. Post-gazette.com. Retrieved 2014-05-07. ^ "U.S. Steel laying off employees worldwide". Pittsburgh Post-Gazette. May 3, 2014. Retrieved May 7, 2014. ^ Northampton County Bicentennial Commission (1976). Two Hundred Years of Life in Northampton County, Pa: Knight, J. and Hahn, B. Communications and transportation. Northampton County Bicentennial Commission. p. 342. Retrieved 24 February 2013. ^ Moody's Investors Service (1976). Moody's Transportation Manual. Mergent FIS. ^ Sexton, Thomas P. (2002-02-01). Pennsylvania's Rail-Trails. Rails-to-Trails Conservancy, Northeast Regional Office. p. 112. Retrieved 24 February 2013. ^ "Dow Additions and Deletion Since 1929". dogsofthedow.com. Retrieved 17 April 2017. ^ Krantz, Matt (June 27, 2014). "S&P 500 loses original member, regains another (kind of)". USA Today. Retrieved July 4, 2014. ^ "U.S. Steel: Dividend history". ussteel.com. Archived from the original on 27 September 2016. Retrieved 17 April 2017. ^ "U. S. Steel". uss.com. Retrieved 17 April 2017. ^ David Brody, Labor in crisis: The steel strike of 1919 (1965). ^ Robert Whaples, "Winning the eight-hour day, 1909–1919." Journal of Economic History 50.02 (1990): 393–406. ^ "Massacre at Republic Steel". illinoislaborhistory.org. Archived from the original on 26 July 2011. Retrieved 17 April 2017. ^ Raymond L. Hogler, "Changing forms of workplace representation: the United States Steel Corporation, 1933–1937." Journal of Management History (1999) 5#6 pp: 349–361. ^ Christopher G.L. Hall, Steel phoenix: The fall and rise of the US steel industry (Palgrave Macmillan, 1997) pp 42–45. ^ Verbatim; Looking for a lifeline The New York Times', August 10, 1986. ^ "Environmental Protection Agency". epa.gov. 2016-04-14. Retrieved 17 April 2017. ^ "09/21/2005: EPA, DOJ and state of Ohio reach agreement with U.S. Steel". epa.gov. Retrieved 17 April 2017. ^ "US Steel Tower, Pittsburgh". SkyscraperPage.com. Retrieved 2014-05-07. ^ "Pittsburgh Post-Gazette - Google News Archive Search". google.com. Retrieved 17 April 2017. ^ Staff. "Producers Agree on Symbol to Appear on Products; Steel Industry Opens Campaign", The New York Times, January 14, 1960. Accessed January 5, 2009. ^ Nicolas P. Maffei, "Selling Gleam: Making Steel Modern in Post-war America." Journal of Design History (2013): ept021. ^ "Pittsburgh Steelers | History of the Steelers Logo". Steelers.com. Archived from the original on 2018-05-14. Retrieved 2014-05-07. ^ "The Unisphere Designation Report" (PDF). Retrieved 2014-05-07. ^ "Unisphere: Biggest World on Earth, The : MPO Productions, Inc. : Free Download & Streaming : Internet Archive". 1964. Retrieved 2014-05-07. ^ "Chicago: 1967 August 15 Picasso Statue Unveiled In Civic Center Plaza". Archived from the original on August 31, 2006. Retrieved 2014-05-07. ^ "Disney's Contemporary Resort". The Disney Drawing Board. Retrieved 2014-05-07. ^ "Construction of WDW Contemporary Resort by U.S. Steel". YouTube. 2007-01-31. Retrieved 2014-05-07. ^ "The Contemporary Resort Hotel (US Steel Commercial)". YouTube. 2008-12-27. Retrieved 2014-05-07. ^ "United States Steel to Construct First Two "Theme Hotels" In Walt Disney World" (PDF). Steton University. Retrieved 2014-05-07. ^ "Daytona Beach Morning Journal - Google News Archive Search". google.com. Retrieved 17 April 2017. ^ "Sarasota Herald-Tribune - Google News Archive Search". google.com. Retrieved 17 April 2017. ^ "St. Petersburg Times - Google News Archive Search". google.com. Retrieved 17 April 2017. ^ "U.S. Steel: Facilities". ussteel.com. Archived from the original on 16 February 2016. Retrieved 17 April 2017. ^ "U.S. Steel: East Chicago Tin". ussteel.com. Archived from the original on 27 September 2016. Retrieved 17 April 2017. ^ "US STEEL TO LAY OFF 350 AT EAST CHICAGO TIN MILL". ABC. January 22, 2015. ^ "U. S. Steel Breaks Ground on State-of-the-Art Expansion at Its Granite City Works". PRNewsire. May 5, 2008. ^ "Duluth News Tribune". duluthnewstribune.com. Archived from the original on 2008-09-25. Retrieved 17 April 2017. ^ "U. S. Steel Completes Purchase of Lone Star Technologies". PRNewswire. June 14, 2007. ^ "USS-Posco to lay off 690 employees in California". Pittsburgh Business Times. January 3, 2014. ^ "United States Steel Corporation Completes Acquisition of Stelco Inc". PRNewswire. October 31, 2007. ^ "Bloomberg - Are you a robot?". Bloomberg News. ^ "Charles M. Schwab - American manufacturer". britannica.com. Retrieved 27 July 2018. ^ "J. A. Farrell Dies. U.S. Steel Ex-Head. Laborer at 15. President for 21 Years of World's Largest Industrial Concern. Dean of 'Foreign Trade'. Broke All Shipments Records. Urged Economic Front With Britain to Insure Peace". New York Times. March 29, 1943. Retrieved 2016-07-05. ^ "The Owosso Argus-Press - Google News Archive Search". google.com. Retrieved 17 April 2017. ^ LIFE – Google Books. Time. 1937-11-08. Retrieved 2014-05-07. ^ "History of United States Steel Corporation – FundingUniverse". Fundinguniverse.com. Retrieved 2017-04-17. ^ "The Press-Courier - Google News Archive Search". google.com. Retrieved 17 April 2017. ^ "US Steel Names Chief". The Milwaukee Journal. 28 Nov 1972. Retrieved 9 Aug 2018. ^ Daniel F. Cuff (1989-01-31). "BUSINESS PEOPLE; President to Succeed Roderick in USX Job – New York Times". Nytimes.com. Retrieved 2014-05-07. ^ "New Chairman and Ceo at Usx". ^ admin@steelguru.com. "US Steel new CEO expected to slash more costs". steelguru.com. Retrieved 17 April 2017. ^ DiChristopher, Tom (10 May 2017). "US Steel's CEO steps down as the company's challenges pile up; COO David Burritt takes over the top job". Brody, David (1987). Labor in Crisis: The Steel Strike of 1919. University of Illinois Press. ISBN 978-0-252-01373-7. Burn, Duncan (1961). The Steel Industry, 1939–1959: A Study in Competition and Planning. Cambridge: Cambridge University Press. ISBN 978-0-521-04385-4. Misa, Thomas (1998). Nation of Steel: The Making of Modern America, 1865–1925. Johns Hopkins University Press. ISBN 978-0-8018-6052-2. Scheuerman, William (1986). The Steel Crisis: The Economics and Politics of a Declining Industry. New York: Praeger Publishers. ISBN 978-0-275-92124-8. Urofsky, Melvin (1969). Big Steel and the Wilson Administration: A Study in Business-Government Relations. Columbus, Ohio: Ohio State University Press. Warne, Colston (1963). R.D. Cross (ed.). The Steel Strike of 1919. D. C. Heath. Warren, Kenneth (2001). Big Steel: The First Century of the United States Steel Corporation, 1901–2001. University of Pittsburgh Press. ISBN 978-0-8229-4160-6. "History of U.S. Steel". U.S. Steel. Retrieved 2008-08-03. Wikimedia Commons has media related to U.S. Steel. 1970s news story "There's more to U.S. Steel then Steel"
1971 news on U.S. Steel's innovations. Historic American Engineering Record (HAER) No. PA-49, "U.S. Steel Corporation, Clairton Works"
HAER No. PA-49-A, "U.S. Steel Corporation, Clairton Works, Blast Furnace Blowing Engine Building"
HAER No. PA-49-B, "U.S. Steel Corporation, Clairton Works, 14-Inch Mill Engines No. 1 & No. 2"
HAER No. PA-49-C, "U.S. Steel Corporation, Clairton Works, 22-Inch Mill Engine"
HAER No. PA-115, "U.S. Steel Duquesne Works"
HAER No. PA-115-A, "U.S. Steel Duquesne Works, Blast Furnace Plant"
HAER No. PA-115-B, "U.S. Steel Duquesne Works, Basic Oxygen Steelmaking Plant"
HAER No. PA-115-C, "U.S. Steel Duquesne Works, Electric Furnace Steelmaking Plant"
HAER No. PA-115-D, "U.S. Steel Duquesne Works, Primary Mill"
HAER No. PA-115-E, "U.S. Steel Duquesne Works, Fuel & Utilities Plant"
HAER No. PA-115-F, "U.S. Steel Duquesne Works, Auxiliary Buildings & Shops"
HAER No. PA-115-G, "U.S. Steel Duquesne Works, 22-Inch Bar Mill"
HAER No. PA-115-H, "U.S. Steel Duquesne Works, Heat Treatment Plant"
Guide to United States Steel Corporation. Training manuals. 5342. Kheel Center for Labor-Management Documentation and Archives, Martin P. Catherwood Library, Cornell University. United States Steel Corporation photographs at Baker Library Special Collections, Harvard Business School. This page was last edited on 25 April 2019, at 05:47 (UTC).